"If you observe the onset of sudden dog stomach pain, and see symptoms such as s painful, tense abdomen it could indicate a condition that is life threatening. The abdomen can be in pain, distended, inflamed, or there could be an insufficient supply of blood to the abdomen (called ischemia). Older dogs have a higher frequency of problems such as a malignant tumor (cancerous) while young dogs could have an injury, dietary problem, infection or intestine problems. If you only see diarrhea with no changes in the abdomen, this is usually self limiting and will resolve on its own and is usually not life threatening. The exception is diarrhea that contains a significant amount of blood. If there is just a bit of blood, the problem could be colitis from stress and is not as serious as blood red diarrhea. If you see vomiting and diarrhea, or vomiting more than 2 to 3 times in a row, then consult with a veterinarian." Gaseous distention of a significant portion of the small intestine. 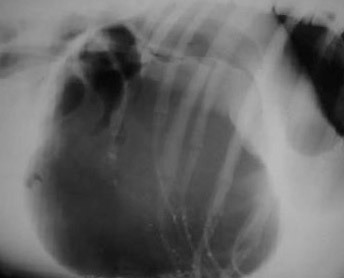 However the distension is not considered sufficient to warrant a diagnosis of intestinal obstruction. One loop of bowel is more distended than the others and partial obstruction should be considered. There is a large amount of material in the stomach. Two breeds are at higher risk for dog stomach pain. Dalmatians: Males are at higher risk for a urethral obstruction. This is caused by higher incidences of urate urinary calculi (urinary stones). German Shepherds: Dogs diagnosed with pancreatic atrophy have a heightened risk of a condition called mesenteric volvulus (twist in the fold that attaches the small intestine to the abdominal all). The twist causes an intestinal obstruction or blockage. Dogs on corticosteroids and other non-steroidal anti-inflammatories are at risk for gastrointestinal ulcers perforations. 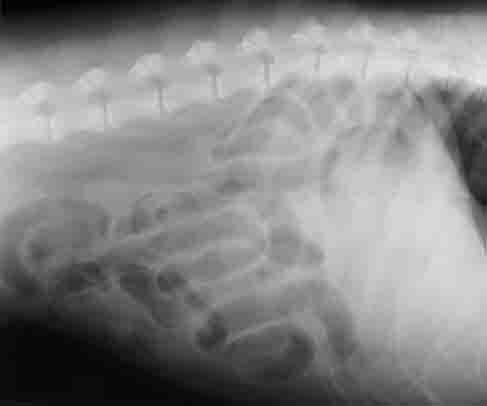 Given the many possible causes for a dog stomach pain, the veterinarian will seek to eliminate those that are most common. To do this a series of tests are conducted such as blood tests (CBC) and urine test (urinalysis). Test results could indicate the underlying cause. For example a low number of white blood cells indicate inflammation and an infection. A gastrointestinal ulcer is detected by low red blood cell counts. X-Rays can find any masses or abnormality in organ shape. It can also detect fluid accumulation. High gas levels could indicate an infection or a ruptured gastrointestinal tract. An Ultrasound test is used to find any abdominal masses, fluids, cysts, abscesses or urinary stones. Testing abdominal fluid using a test called amniocentesis is used on dogs with sudden abdominal pain. Foreign bodies can sometimes be found by palpitating the abdomen (touching the abdomen from outside the body). If the cause cannot be determine with testing, a veterinarian may want to explore the abdomen surgically. A specific diagnosis of the underlying cause is needed before treatment can begin. Until the cause is determined, the Vet will address any symptoms such as pain relief (analgesics). Gas production can be reduce with histamine H2 antagonists. The Vet will also determine if emergency intervention or surgery is needed. For symptoms such as vomiting, nothing by mouth is recommended until the underlying cause is determined. If there is fluid loss, intravenous therapy is needed.